A visit to Bali and many raw vegan moments to inspire the senses! 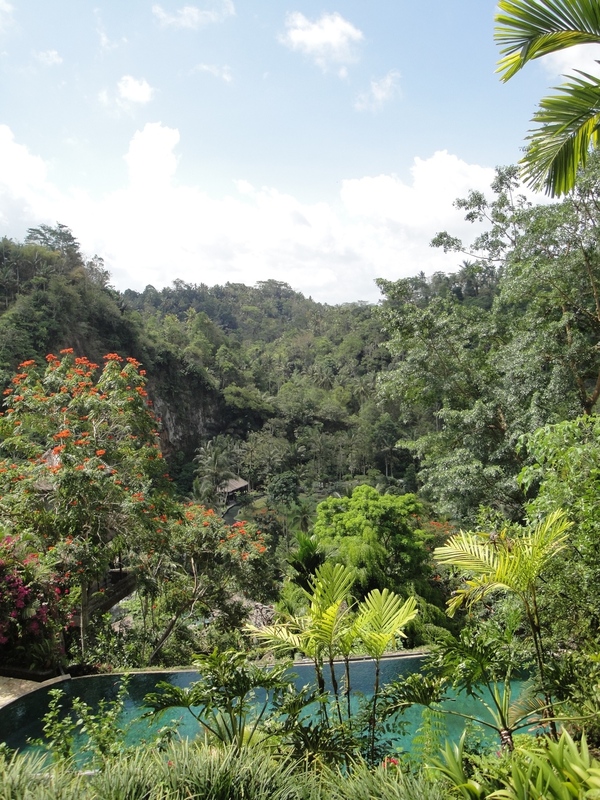 Finally I made my way to Bali, seduced by a dance retreat with Jo Cobbett! I got unimaginably carried away on the dance floor and left my camera tucked away a lot (thank God) , but I did take a few photos, specially of food for any of you who read my blog posts and enjoy the foodie photos from around the globe, here you go enjoy with love and devotion for the dark and the light of this life. May you be inspired. In Bali, specifically Ubud, marvel at the ripe lush tropical fruit hanging around every bend beckoning you, the hibiscus blossoms, butterflies, nasi campur (mixed rice with yummy stuff), daily crispy fried tempeh bits, turmeric cold pressed healing juices, fresh coconuts so big you must embrace them, gut cleansing Bali coffee with cashew milk, more local cashew milk, raw cakes galore, raw wraps to keep you rolling and ordering, cocobiotics, healing medicinal tonics and reishi teas, kombuchas, raw crackers and breads, out of this world cashew sour cream in raw lasagna, banana pancakes and more banana pancakes and the Balinese kind hearted nature. Morning peace at The Yellow Flower Cafe in Ubud. Bali favourite for breakfast Banana Pancakes made with Rice and drizzled local Palm Syrup. At Yellow Flower they serve you a complementary glass of Cempaka flower water... so I definitely came back! Kombucha at The Clear Cafe on Monkey Forest Road, love the name of the roads, Australia get your groove on with naming public places. Vegan Pad Thai @ Clear Cafe. Cloud 9 is the name of this raw Vanilla Cream Raspberry Oat Crust Cake at Alchemy. Coconuts waiting to be ordered. Turmeric Medicinal: Fresh turmeric, coconut water, lime. Bali appears to grow this stuff prolifically. The entrance to a home welcoming devotional altar. Cashew Milk to last a lifetime. Raw Greenola with Cashew Milk and Fresh Fruit. Nasi Campur at Yellow Flower. Crazy caterpillars visiting the breakfast table. Interesting Pandan Jelly dessert made with Rice again. Make a path around the trees. Tropical local fruit and Bali coffee with coconut milk for breakfast. Lunch to go from Kafe. A Yantra swimming pool at Shankaris! View from the Royal Pita Maha. What a location for a restaurant. Raw vegan salad for take away in this awesome banana leaf container! Camouflaged at the water temple heehee. Raw cucumber rolls with sunflower seed pate. Raw coconut flesh wraps with crunchy cabbage and peanut dipping sauce at Alchemy. Clear Cafe rice paper rolls.